Our kids are big milk drinkers, which we have found is not so common in other parts of the world. Thankfully Ireland shares our passion for milk, and the best part is no matter where you are staying you can look forward to amazingly delicious and fresh glass of milk. We first noticed this at the Dublin Airport the day we arrived. 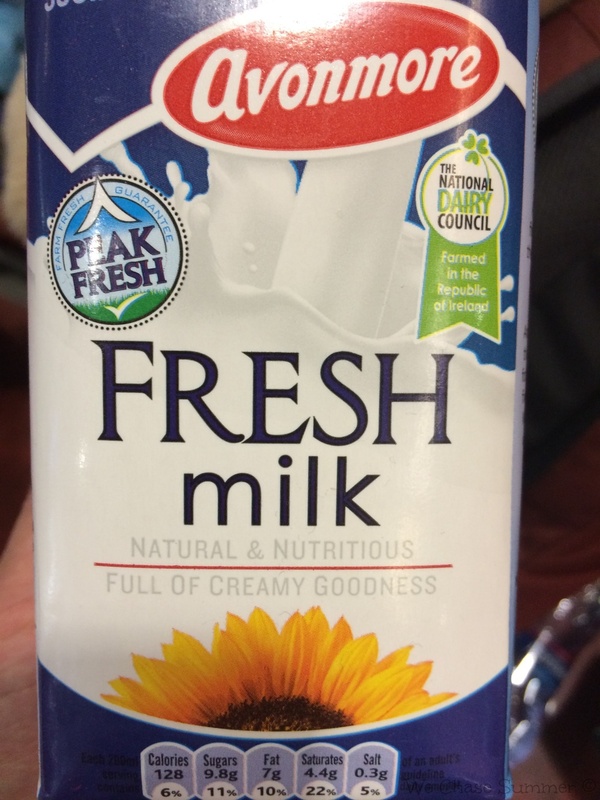 Yes, you read that right, the milk at the little market at the airport was absolutely delicious, some of the best we've ever had... that's certainly not something you normally expect at an airport! This trend continued regardless of where we got milk from. We later found out that all of the milk in Ireland is sold exclusively within the county it is produced in, guaranteeing the freshest milk experience you will find anywhere. It seemed everywhere we went, there were always some very unique and special local events going on. 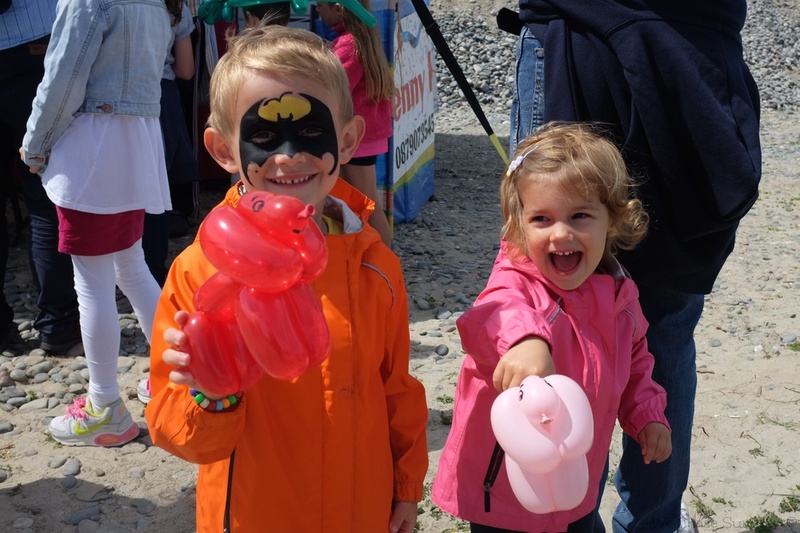 Even though Louisburgh is a very small town, there were two great events during the month of July: the Carrowniskey Beach Horse Races and the Louisburgh Horse Show. While not free, both events were very family friendly, and had entertainment such as bounce houses, go-kart racing, and face painting. While in Galway, there was an Arts Festival, which may have contributed to the abundance of street performers around. In Killarney, it just so happened we arrived on the day of the Killarney Races and Ladies Day, where women dress up in fancy dresses in hopes to win awards for a variety of categories. So regardless of where you are staying in Ireland, look online or ask the locals about upcoming events, you may get to experience some real local fun! Located roughly halfway between Louisburgh and Westport is the awe inspiring Croagh Patrick mountain. Croagh Patrick has significant local history, and hundreds of thousands of pilgrims visit every year to climb the mountain. Here are some of the highlights. Access to the mountain is free, you just need to pay for metered parking. Hiking to the top of the mountain is an ambitious adventure for a family with young children, it is very steep and rocky in parts, and we only made it about two-thirds of the way up before needing to turn back. Children over 5 should be physically able to make the hike to the top with help, but younger children probably will find themselves not up to the task. 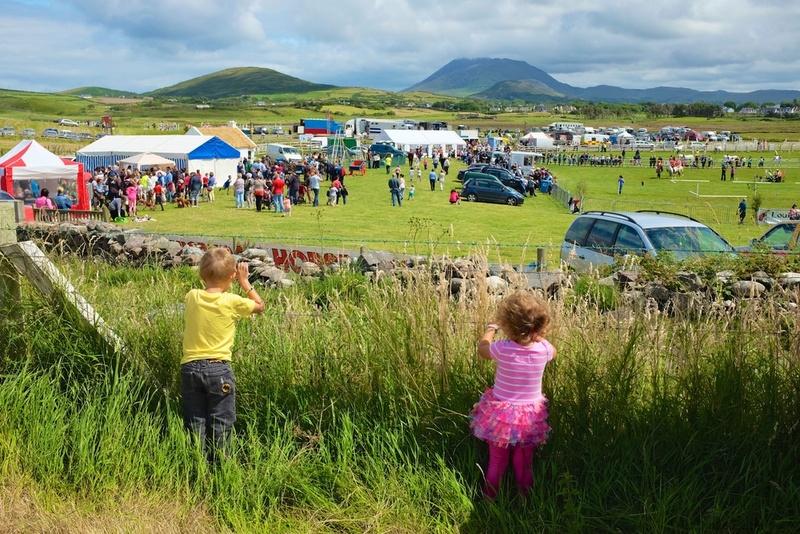 Even if you don't find yourself in Ireland during the annual pilgrimage, if your family loves hiking, make the time for a trip to Croagh Patrick. Don't worry if you don't make it to the top, your goal should be to enjoy the hike and the views. Read our blog for more about our Croagh Patrick pilgrimage. One suggestion we had heard from multiple people is to visit the Aran Islands. After talking to some of the locals, we instead visited the smaller and more quaint Clare Island. 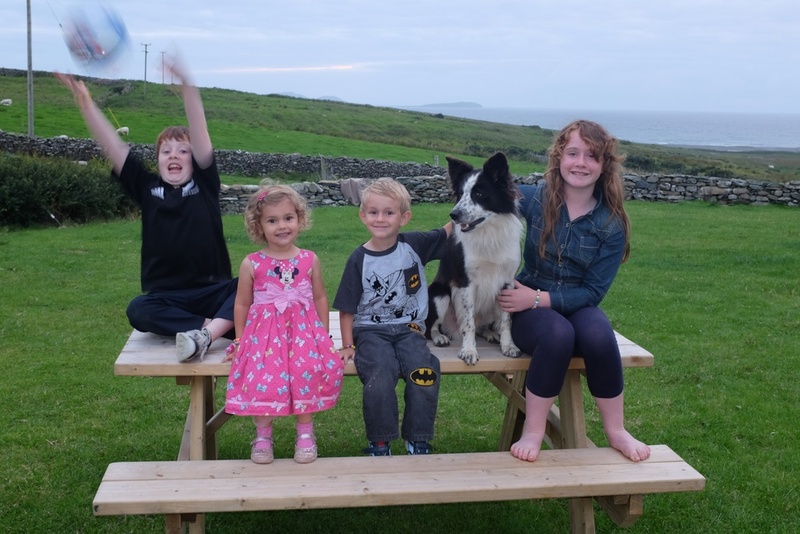 One reason we decided on Clare Island is the distance, it is right across from Louisburgh, in fact we had a wonderful view of it from our cottage. The Aran Islands are several hours away, closer to Galway, so not quite as convenient. 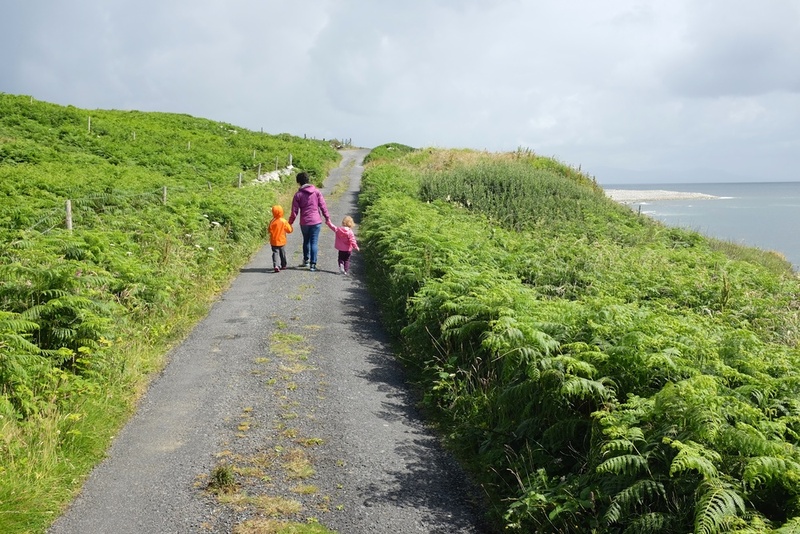 The other reason is that the Aran Islands are a popular tourist destination, and while in Ireland we really loved just being away from the crowds. To get to Clare Island, there are two ferry services located right next to the Louisburgh town center. You take a small speed boat to the island (the ride takes about 10 minutes), and from there you are on your own. There are multiple hiking paths you can take, we opted for the easier one which takes you up to the lighthouse. For people hiking without kids, you can make a circuit around the whole island, which would be an all day adventure. Even with the "shorter" walk, we were still walking for most of the day. It really is a quiet island, a majority of the people we came across were others from the same boat we took to get to the island. Pretty much the only other things you'll come across on your walk are sheep, lots and lots of sheep! As a great pit stop, we recommend stopping at Anna's Coffee Shop, a very family friendly place to grab a bite to eat. The trek to the lighthouse is absolutely worth it, as once you get there you have amazing views of steep cliffs descending into the Atlantic. Just beware for those afraid of heights, or those with little kids, as there are no barriers to keep you from tumbling off the cliffs! Read our blog for more about Clare Island. If you find yourself in Killarney with kids, definitely make the trip to the Muckross Traditional Farms. This is an area frozen in time, displaying what life was like in Ireland in the 1930's and 1940's. After arriving at the farm, your first choice will be if you want to walk to the various stops along the circular path, or take the free bus. We chose to walk because it was a beautiful day and we love to walk, but most others opted for the bus. Don't worry, even if you decide to walk at first, you can get back on the bus at any of the other stops. As you make the circuit of the farm, you'll get to see typical farm houses of various sizes, take part in activities such as milking cows and making butter, look at and pet a number of farm animals, and learn about what life was like in Ireland during this time period. Some other highlights include a wonderful woodland playground, a bounce house, and a baby animal petting zoo. 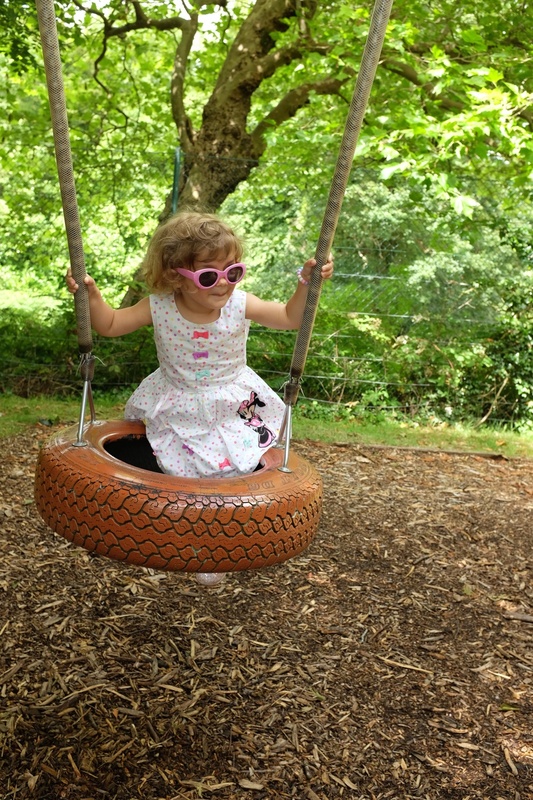 We spent so much time wandering around at the farm, we ended up not seeing some of the other sights on the same grounds we had planned to see that day, such as the Muckross House and Gardens, but we don't regret that for a moment as we all had so much fun at the farm. Read our blog for more about the Muckross Traditional Farms. If you're staying in Western Ireland, chances are very high you have rented a car, as it's the only way to get around. We absolutely loved our little town of Louisburgh, but we wanted to experience what else Western Ireland had to offer. A four day road trip took us from Westport to Kilarney, and everything in between. Here are the places you must visit while in the area. Located only about a half hour from Louisburgh, Westport is a real gem of a town. Three time winner of Ireland's tidiest town, Westport provides tourists with a wonderful Irish medium sized town experience. The town center has a number of nice restaurants and shops. We especially loved the award winning chowder at The West and the lovely ambience of The Creel. While the town is great to visit, and there are many things to do in the area, it is somewhat of a quiet town, and you can experience the town itself in just one day. Even still, with it being the closest town to Louisburgh with a big supermarket, we frequently enjoyed day trips into Westport just to hang out. 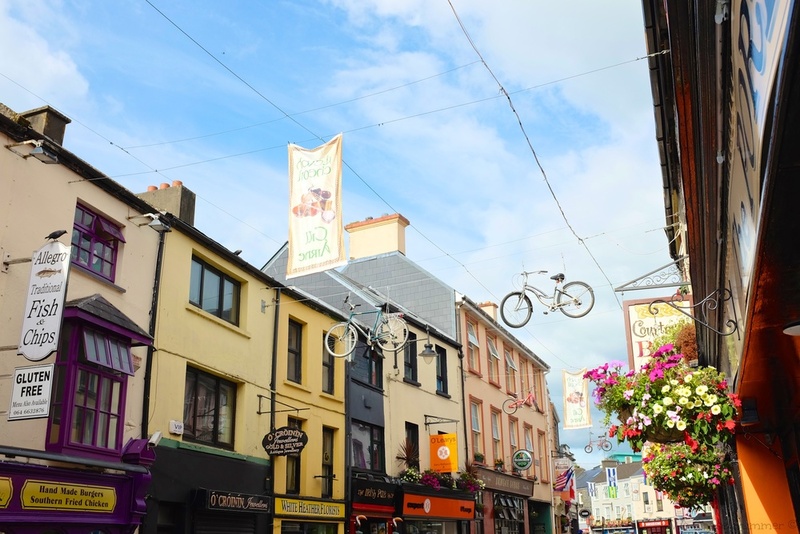 For those looking for a bigger town experience, you'll need to head to Galway. Read our blog for more about Westport. 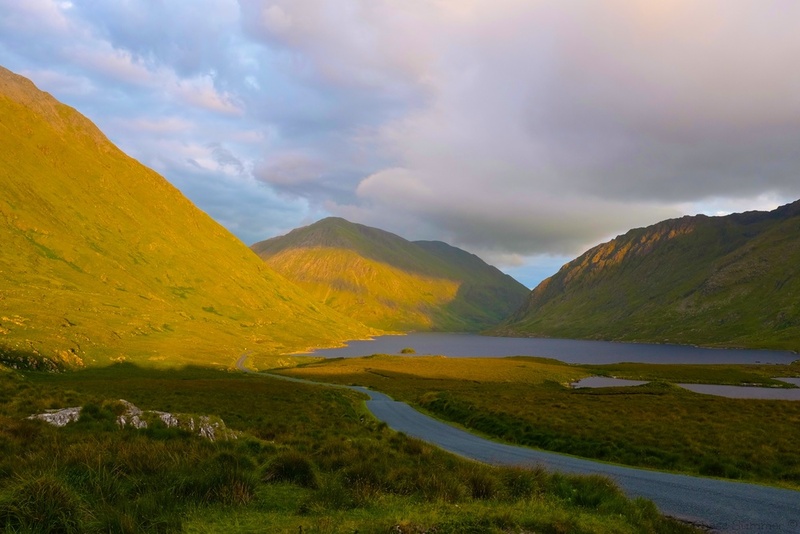 Galway is located about two hours away from Louisburgh, and the road to get there takes you past the amazing and scenic Doolough Lake (more about this in the Wild Atlantic Way section). 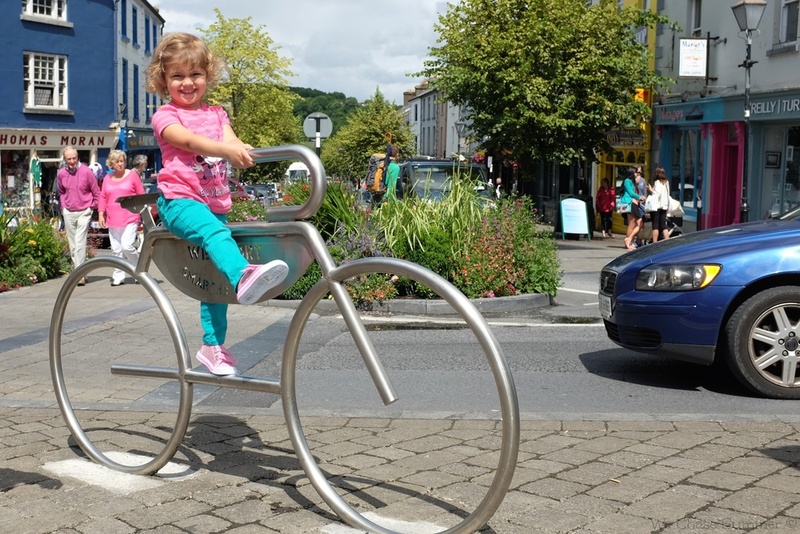 Once in Galway, you'll experience a much more active and happening town, in our opinion even nicer than Dublin. There were many street performers putting on entertaining shows for large crowds. We got to experience a joking fire juggler on a unicycle, an escape artist which amazed our son, and many musical acts which both our kids liked dancing to. The town has a big night life, which we didn't really get to experience, but did hear quite a bit of from our hostel room. We'd suggest 1-2 days in Galway in order to see it properly. Read our blog for more about Galway (day one and day two). Killarney is another big town, though smaller than Galway, but somehow it manages to maintain more of a quaint town feel. In addition to the charming town center, you can partake in a horse drawn carriage ride through the park, or venture out to nearby Ross Castle and the Muckross House and Traditional Farms. You can easily spend 2-3 days in Kilarney in order to experience what it has to offer. Prior to coming to Ireland, we never really equated Ireland with gorgeous beaches, but that's exactly what you'll find when you visit. 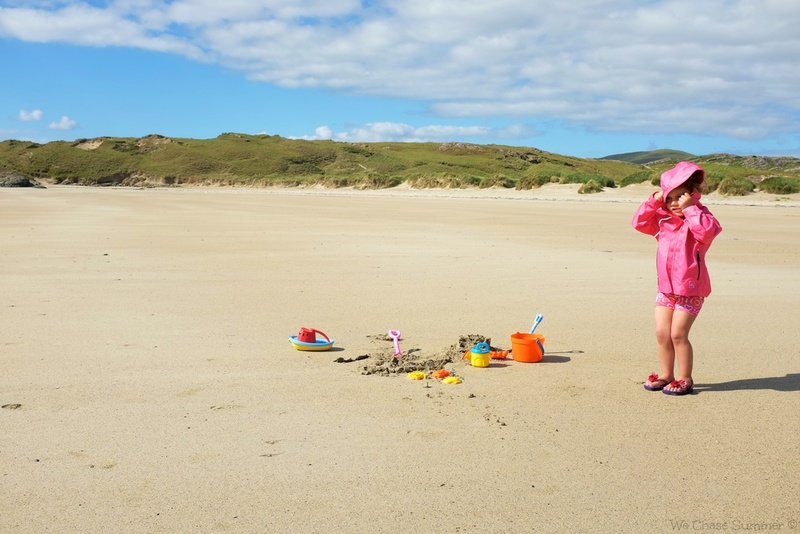 The west coast in particular, with its Wild Atlantic Way (more on this later), has many beautiful beaches, each with their own unique features like views of dramatic cliffs and islands. One thing they all have in common is the weather, Ireland is not exactly a hot country, even in July. The water is chilly, and the windy beach is not always pleasant to lie on and sunbathe, but don't let that deter you from experiencing these amazing beaches, you just need to come prepared differently than you might when going to the beach say in the Caribbean. The locals, adults and children alike, typically wear wetsuits to keep warm, so it may be worth buying or renting one if you plan to spend a lot of time in the water. Another thing to point out about the beaches is the abundance of jellyfish, which you can find in the water and washed up on the shore. We were slightly worried at first about the kids getting stung, but locals assured us they are pretty harmless, and you can tell how cautious you should be based on their colors: "Purple or White - You should be all right. Orange and Black - Stay back". 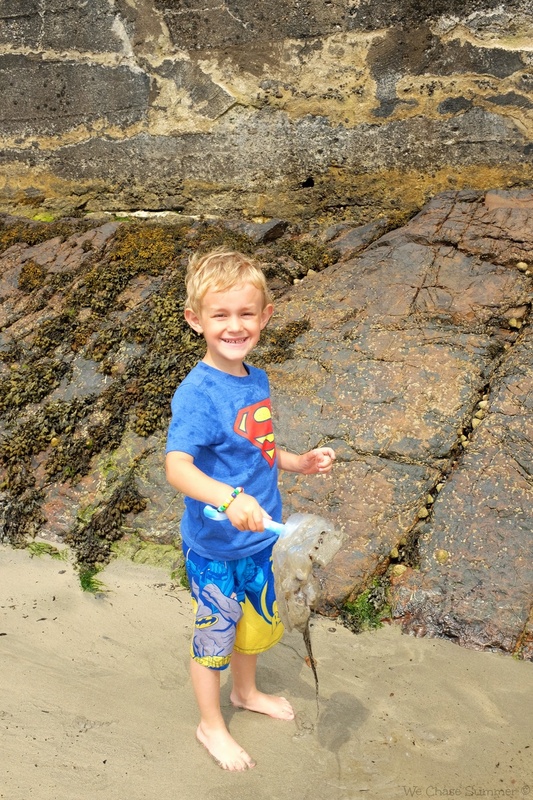 Disgusting as it sounds, our kids loved picking up the dead jellyfish with shovels and cleaning them off the beach. We have never experienced hospitality like we have in Ireland. In fact, come to think of it, I can't recall a single unfriendly person we met in the entire time we were there. The first stop we made in Dublin was at a random little cafe just to grab a snack. Somehow we struck up a long conversation with the guy who worked there, he gave us lots of tips about what to see in the area, and afterwards he gave us a free city map (which they normally charge for) and some free candy bars for the kids as well. This ended up being far from an isolated incident of kindness. The hosts at our AirBNB house were so nice and considerate to us the whole time we were there. Before leaving, they had us over for dinner, and in addition to providing us with some yummy oysters, salmon, and fresh lamb, they also had their young children sing and play instruments for us as entertainment. On most trips we made to the beach or playground, we ended up making friends with other families, and have even made lasting friendships. It certainly helps that the there is no language barrier, but that isn't the only factor. The people are just genuinely friendly, and they want to talk to you, get to know you, and help you out if they can. It's a big contrast from life in NJ and NY, were most people won't spare you a glance, much less a smile. The best way to experience life in Ireland is to stay on a farm. We found the amazing Devlin House using Air BNB, and recommend it very highly to anyone looking to make this kind of a trip. The house, located in County Mayo in Western Ireland, is on a secluded farm right on the Atlantic Ocean. The farm has many sheep, many chickens, two roosters, two horses, and a sheep dog (Sam). Living on the farm is an unforgettable experience. We had fresh eggs from the chickens practically every day, our view from the kitchen window was of sheep and the Atlantic Ocean, and the lawnmower was a horse. There was not good wifi, and while bad for blogging, it gave us a chance to disconnect from the online world for a bit and get back to making more real life connections. You and your kids will quickly learn to appreciate the increase of "face" time and the decrease of "screen" time. It is a truly an amazing experience, and will really help grow your family in a way you have not experienced before. 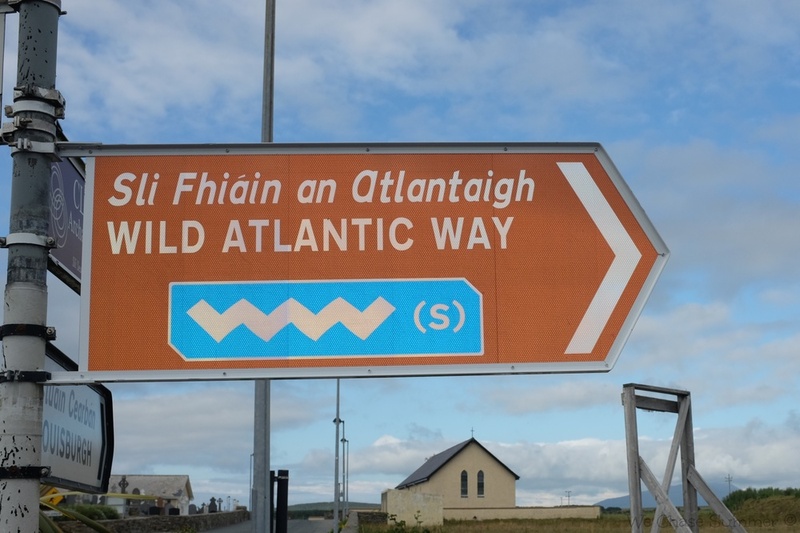 Perhaps the most stunning part of Western Ireland is the 2,500 km Wild Atlantic Way, which spans pretty much the entire western coast of Ireland. While it's not the most direct route for traveling between two places (and it is generally very narrow roadways), the views you will witness are breathtaking. One of our favorite parts of driving on the Wild Atlantic Way was actually not by the coast line, instead, it was between Louisburgh and Leenane, which takes you past the gorgeous Doolough Lake and Kilary Fjord. Another favorite was the Cliffs of Moher. While unfortunately you have to pay just to access the cliffs, the views are unprecedented. If you visit Western Ireland we strongly suggest you rent a car even if for a few days to drive a portion of the Wild Atlantic. You will never forget it. 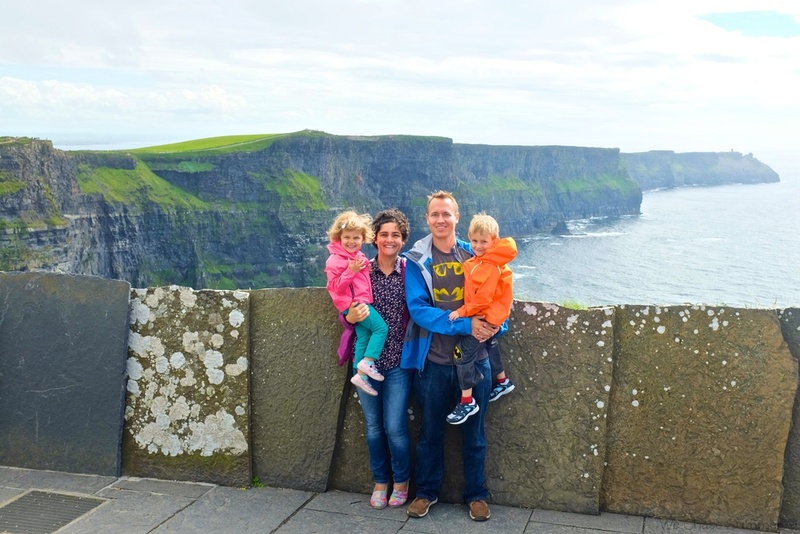 Read our blog for more on our trips on the Wild Atlantic Way, including Doolough Lake and Kilary Fjord, and the Cliffs of Moher. Also check out our Ireland page for more about our Irish travel adventure.